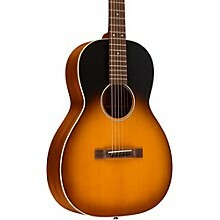 The 00-17S features a solid Sitka spruce top, mahogany back and sides and a rosewood fingerboard and matching bridge. The sleek modified low oval neck with a Performing Artist taper allows for greater ease of play up and down the fretboard. The captivating Whiskey Sunset finish on this Grand Concert model is as pleasing to the eyes as the guitar's tone will be to your ears.This model comes equipped with Matrix VT Enhance acoustic amplification by Fishman. Martin has the bluegrass, rock and folk genres covered, but Martin didn’t feel like they were showing people how great their guitars sound as blues guitars. Martin really wanted to create a series of guitars that would sound at home playing Robert Johnson’s “32-20 Blues” or a Big Bill Broonzy song. Martin wanted the guitars to be blue collar and inviting. Guitars that are meant to be picked up and played, not pampered. 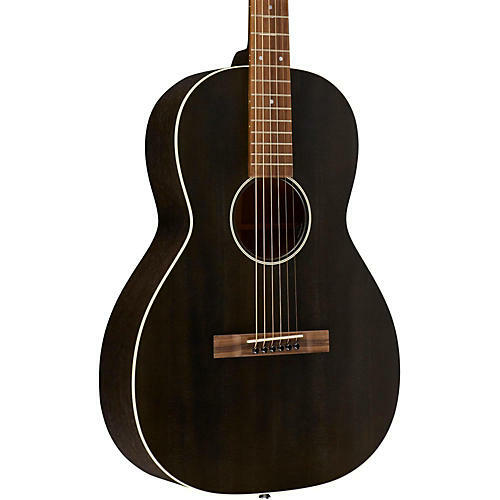 Martin specifically developed two finish options, Black Smoke and Whiskey Sunset, that Martin felt looked at home in a Mississippi juke joint or Memphis blues club. The open pore, ultra-thin satin finish lends itself to the weathered and broken-in appeal. The straight bridge and ivoroid button open back tuners add to the effect. Martin opted for mahogany back and sides with a Sitka spruce top because it works so well with a variety of small body sizes. This combination of wood is responsive enough for Lightning Hopkins fingerstyle playing or more modern blues using a pick. A single piece of ivoroid binding was chosen for the top with no binding on the back. The neck is mahogany with a rosewood fingerboard and bridge. Exotic and ultra-high quality materials crafted by America’s premier guitar builder at an affordable price. The Matrix VT Enhance feature a new bridge plate mounted transducer to add dimension, resonance, and body to the tone of the guitar. The Matrix VT Enhanced is unobtrusive, with no controls or holes cut into the side of the guitar. The easy-to-use Volume, Tone and Enhance Blend controls are mounted inside the soundhole for convenient access during performance. The resulting sound quality meets the Martin standard of excellence with an unmatched sound and responsiveness to touch and playing. The battery box integrated into endpin jack for easy access. Fishman’s new Enhance Transducer is a bridge plate transducer that is mechanically and electrically optimized to bring out the sound of the body, and the dynamic and percussive elements of guitar playing. The Enhance Transducer is specially designed to capture the longitudinal energy (dynamic and percussive attack) of the guitar top while being highly resistant to the transverse energy that manifests in string squeak, body handling noise, and parasitic feedback. The Enhance Transducer adds these body characteristics to the full spectrum audio performance Matrix VT Enhance to deliver a new level of sound quality and dynamic playing response. The result is a sound that is pure Martin, with more responsiveness to your playing dynamics and touch.